Southern Supply specializes in quality fire protection products and extinguisher services that comply with local codes and meet the regulations of the NFPA 10. Our shop has hydrostatic testing machines and fully furnished recharge tables with extra recharging housing units. Fire extinguishers must be inspected at least once a year by a state-certified technician in order to meet Georgia State Fire Insurance requirements. Our technicians are trained and certified to service fire extinguishers and remain in compliance with regulatory agencies. Our fire extinguisher services include annual or monthly inspection, six-year maintenance, 12-year hydro testing, and recharging. 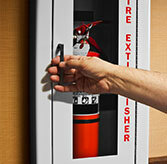 We carry three main extinguisher cabinet brands: JL Industries, Larsen, and Potter Roemer. If your fire extinguisher cabinet requires certain design specifications, we work with our vendors to build exactly what you need. At Southern Safety Supply, we sell and test fire hoses, as well as order fire hose fittings. We supply Scotty Firefighter and Cold Fire extinguishing foams and accessories. We stock products that are NFPA and UL certified. Unlike many safety supply companies, we are pleased to have a store front where customers can drop off their extinguishers to be serviced in-shop. This is a cost-effective alternative for companies who prefer this option. Our store also enables customers to visualize the exact safety supplies they need. Since we have the majority of our products in stock, you don’t have to wait for your crucial safety equipment to be shipped.